Doctors across Canada are sympathetic towards patients and the immense strain the healthcare system is under. Many of us have been involved in a campaign with Choosing Wisely Canada to reduce unnecessary tests, treatments and procedures, which cost the healthcare system millions of dollars and provide no added benefit to patient care. As Anesthesiologists, we champion patient safety from the time surgery is booked until the post-operative period. Before patients come to the operating room, we conduct a detailed review and assess complex patients in the pre-operative clinic. This detailed review gives us all the information we need to take care of patients as they go through one of the most critical periods in their life. As part of the Choosing Wisely campaign, the Canadian Anesthesiologists Society (CAS) put forth five recommendations targeting the reduction of unnecessary blood work, EKG’s, chest x-rays, echocardiograms and stress testing. This has been highly successful and many Anesthesia departments have already adopted these changes into practice. Implementing these changes is a highly complex endeavor and a daunting task for most institutions, which poses a challenge. The process by which a patient arrives in the operating room involves many steps and interactions within the healthcare system. Changes to any step have a ripple effect that impacts processes both before and after. Moreover, it requires buy in and support from many key stakeholders including surgeons’ offices, anesthesiologists, nursing and hospital administration. To provide guidance and support, Ontario’s Anesthesiologists, a section of the OMA, has published a guide to help implement the Choosing Wisely recommendations. Five Ontario hospitals that have implemented these guidelines are profiled as case studies. Each hospital describes how specific hurdles and resistance were tackled. No two hospitals had the exact same experience and each had unique starting points and will offer different perspectives and approaches. The resource section is particularly useful as it provides sample orders sets, medical directives, questionnaires and testing grids, which can be used as templates and modified as needed. 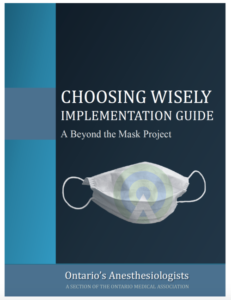 Please click on these links to review the CAS Choosing Wisely recommendations and the Ontario’s Anesthesiologists Implementation Guide. The team that prepared this guide will be happy to address any questions and provide further support as needed.